20th anniversary of the events at Tiananmen (六四事件 / “June 4th Incident”). And, actor David Carradine hanged himself in Thailand. Back in January an acquaintance of mine, let’s call her “Kacy,” had a red truck and a boyfriend, and all was right with the world. The truck was beat up and scruffy looking, but it never broke down and the four-wheel drive got Kacy out of any muddy trouble she could get herself into. The boyfriend was equally endearing, though significantly easier on the eyes. He dressed well and always had a snappy compliment for whomever he was speaking with. Trained as an electrician, he scored major “boyfriend points” by fixing Kacy’s mom’s refrigerator and anything else that would go on the fritz. And in muggy Belize, there’s no shortage of electrical equipment acting up. As was the custom, Kacy and Mr. Right lived together. Though it’s common for unmarried couples to live together in many parts of the world, the phenomenon reaches new heights here. Truth is many couples choose to never get married even after years of cohabitation and multiple children together. It’s hard to say why this happens, but the fondness both genders have for affairs outside of their main relationships certainly must add to the trend. There’s no shortage of this. Both women and men will openly talk about new flings they have with people who are not their “baby mama” or “husband.” More to the point of how loose these relationships are, the words “husband” and “wife” are used loosely and frequently attributed to common law arrangements, or even boyfriends and girlfriends who have been dating for, say, more than six months. Clearly the laid back indifference of the Caribbean extends to Belizean relationship labels. But I digress. Kacy and Mr. Right were living together at her home. Many of his clothes hung in her closet, his tools were there and his car sat outside next to her truck. All was right with the world. But this all changed one April day when Mr. Right borrowed Kacy’s beat up red truck to run an errand that required the 4×4 capability his sedan couldn’t provide. And he never returned. No note, no phone call, no nothing. Mr. Right was Mr. Gone. He vanished, and he took that reliable pickup truck with him. Kacy’s reaction was equally amazing/perplexing as she didn’t complain or do anything (substantial) about the disappearance for two months. Sure, she tried calling him, but he never answered her calls and she never persisted any further. She simply lived her life and drove his car around town in his absence. He couldn’t be gone for long if he left his car and belongings at her house, could he? Well after two months it started looking like he could. Kacy started to worry so she put in a call to his mother. She said he had two days to check in with her or she would call the police. In the meantime she checked with the company he claimed to work for and learned he had been employed there … three years earlier. A little more investigation found that he had not just the two kids he admitted to, but six. With three mothers. Things started stinking worse than the Saturday fish market. After the two day window, a call to the police provided a lot of clarification. Turns out Mr. Gone had been previously incarcerated for auto theft in Belize City, and he had a current warrant out for his arrest in Corozal. (Charges were unspecified.) He was due in Corozal court this past Monday, so if Kacy put in a formal complaint against him the police would extradite him back to Punta Gorda after his hearing. And they’d bring the truck too! Things were starting to look up. Kacy would get her truck back and get this loser out of her life forever. She’s been all smiles all week! Then this morning she found out the police officer driving her truck to her – with Mr. Wrong along for the ride – flipped the vehicle in transit. Mr. Wrong and the driver are in stable condition, and another cop who was riding in the bed is in critical condition. 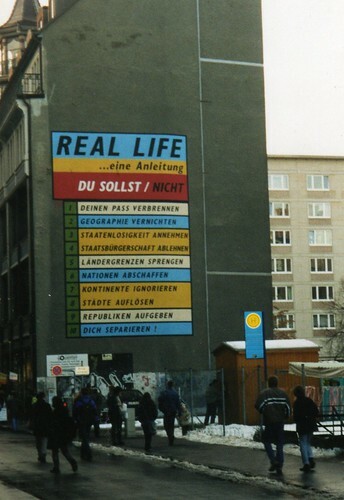 I was 20 and in Germany during the 2000 presidential election. The night of November 7th, I sat up in my apartment until 4:00 am wondering what was going on with the numbers from Florida. By the time I returned from Europe, George W. Bush had been sworn in as the 43rd POTUS. During his first term I traveled to or lived in eight other nations, and as time wore on the questions about my President became more and more difficult. He was viewed as arrogant and ignorant — a horrible combination in leadership — and his unilateral approach to foreign policy was not well-received abroad, especially in its stark contrast to the approach of the previous administration. Suffice to say, George W. Bush made it more difficult to be an American overseas. A little while ago I wrote about national spending priorities and the need for investment in “green collar” jobs and infrastructure designed around energy efficiencies. That post garnered me some attention in the blogosphere and I was contacted by a representative from the ShoreBank Corporation. It’s good that more and more people are talking about these ideas (like me), and more and more are taking action on them (ShoreBank). And this bank has been at it a long time. ShoreBank is a community development bank out of Chicago with branches and subsidiaries around the country. It invests in activities designed to spur economic development in low-income areas, and serve communities oft inadequately served by traditional banks. You may have heard of Grameen Bank in Bangladesh whose founder, Muhammad Yunus, was awarded the 2006 Nobel Peace Prize for the bank’s activities. Same idea. I’m very pleased that this is my first blog post of the new year. It’s the types of business opportunities that these organizations support that we need to look toward as we rebuild our economies and industries in 2009. According to their website, “ShoreBank Corp. is America’s first community development and environmental bank holding company. Their tagline is, “Let’s Change the World.” Sounds good to me. YouTube is fantastic, so is this video. After the tsunami ravaged Asia in December 2004 a cacophony of odd sea specimens washed up on shore. Dredged from the bottom of the ocean, some look truly alien. My favorite is whatever comes up at the 0:30 mark. What is that? Though I generally want to refrain from republishing news reported by others in this blog, I just had to share this very disturbing story of corruption in the Defense Department. Published in Wired Magazine’s Danger Room blog, the story articulates how friends of then-Secretary of Defense benefited to the tune of $9.2 million through a program intended to show overseas troops that the American public supports them. The idea behind America Supports You was simple. “If you’re serving overseas, and you watch the mainstream media coverage, sometimes you can’t tell if America knows you’re there,” said a program official. The problem was that the troops were not the only ones benefiting. Soon monies started funneling into “questionable and unregulated actions.” Then directors of PR firm Susan Davis International started receiving salaries ranging $300k-600k from the fund. Then Mitch Semel was given a half million dollars for web work. Most of the money was laundered through the Pentagon-run Stars & Stripes newspaper. Absolutely horrible. In light of everything happening with the corruption surrounding Illinois Gov. Blogojevich and the general concern over the mishandling of the wars in Afghanistan, and particularly, Iraq, this story is really disheartening. Problem is, with some of the other stories regarding no-bid contracts and general abuses as a result of the wars, this really feels like small potatos.